Girl, I can imagine this happening to you the first time, but as popular as you are, I can't imagine it happening more than just that first time. I am terribly sad that I don't get to go this year, but that feeling would be terror if I were actually attending. I'll go next year and will do all of the embarrassingly wrong things that you've done. It'll be great! Oh, the memories in our minds... See you soon! I wish I could be there, dumb life getting in the way. Have fun. Can't wait to see the pictures. Dear all: BlogHer is worth the tripping over my too long maxi skirt and spilling coffee all over the beautiful hotel floors. So worth it. for women...kills me...i got no where to go...smiles. Thanks for writing this. I'm going this year for the first time and am a tad terrified of the throngs of people. I can't wait to give you a hug and I'll try not to slap you in the face with my flabby arms. I cannot wait. It's going to be so magical and informative and fun and whatever you want to get out of it YOU WILL. It is that massive and that absolutely worth it. Push past the fear. Less than a month! I'm still pinching myself that I'm going. I will be an anxious, sweaty mess on the train ride down - wanted to warn you in advance. I'm SO sad I'm not going this year. I felt terribly overwhelmed by it last year (but still had a good time) and then made plans during that time this year, I think in a subconscious effort to keep myself from having to be brave. And I'm feeling so annoyed with myself now because I'm wishing I was going. Next year! Have a blast with all the blog peeps, Alexandra!! I'll miss you, Anna. ANy plans for next year's Erma Bombeck? It meant so much to me to meet you there!!!!!! You were a highlight, Anna. This year, I want to spend time with you. How I wish I could be there to take my prize in the awkward pauses and/or inappropriate comments competition. I bet that you don't have flabby armpits at all. Those pictures say you don't, anyway. Oh how I wish. Enjoy yourself! It'll be great to be with you again, Linda. I really like talking to you and am so happy we met. It really is a rare opportunity to thank and hug and look into the eyes of all the other bloggers and writers who helped you, shared you, made you think, made you want to be better, reached out in tough times, celebrated in good times. 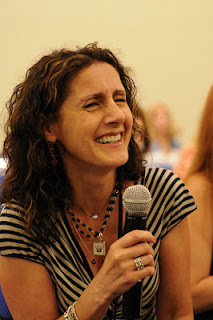 I look forward to BlogHer so much now, and will relish in every moment. Hey girl -- I bought my pass already. Now I just have to book the flight and find roommates. But I'm still on the fence. It'll be so fun to see you, Beautiful Shannon. wow, this is AMAZING!!!!!!!!! you said everything i have felt in those situations! wow. What? You have gorgeous arms! It'll be so nice, Suni. You are the best. I think the smartest thing I did for my first BlogHer in San Diego two years ago was to make plans to meet up with you just after I got there...two newbies who had never met before but shared in the terror and wanted to make a new friend, fast. We broke the ice and ended up enjoy ourselves thoroughly. You've phrased it all beautifully. I wish we would've done it one more time, Nancy. You're a doll. I can't wait to meet wonderful, fantastic, non-flabby arms--you in real life. I'm excited to meet you, Estelle!! This post makes me smile mostly because you get to the bottom of the feelings we all feel sitting in that safe hotel room, I take comfort knowing you know exactly - having been there yourself. I met you at my first small conference (that I contemplated ditching) - can't wait to see your smiling face this year! I'd like to know when you ever had flabby arms btw.. I'm glad you wrote this. I'm a newbie this year and am scared out of my ever-loving mind. I most likely WILL spent a good portion of the weekend in my room. So stop up and say hey, won't you? I would really really love to attend and meet you, even if you were wearing a tank top. Scratch that. ESPECIALLY if you were wearing a tank top. Also, HUGE congratulations on being one of bloggers voice of the year. Those blogher people clearly know what they're doing. I am currently in the "i bought my ticket but am now dreading it" category. 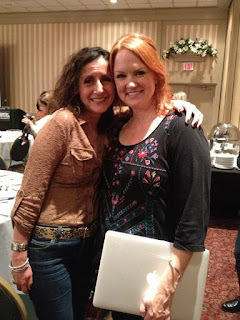 This is my first Blogher and the thought of it makes me want to pee from both excitement and nerves. My anxiety increases daily and I'm afraid I'm going to spend the entire time hiding under a table. But...I am super excited to meet the fabulous bloggers that I stalk (or wish I could stalk more often). I can't wait to meet you. There will be much squeeing. Thank you so much for writing all this. I'm not going, but again you read my mind. I'm not going partly because we're traveling so much this summer that the bank account's depleted, but also because of all the things that you wrote in the post. I'm so quiet as it is as a blogger (and I don't even have to talk or show my face! ), and I imagine myself steamrolled in such a huge gathering. I'd love to go though, because I would love, love to meet other bloggers. Someday. But I will only go if I know you will be there! I'm not sure if we met last year — my first; very nervous — but I am so looking forward to properly meeting you in person in a few weeks! Luv this post, Alexandra! Thanks for pointing me to it via your message (sorry for the Contact Us form difficulties!) and I will definitely pull a few quotes from it for my Newbie Breakfast presentation. Thank you, thank you! Look forward to meeting in Chicago and hugging you w/my flabby arms.